For adult comic fans, superheroes and beer always go together. 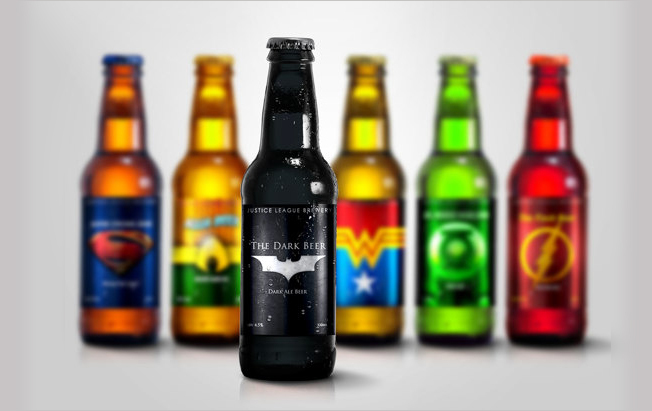 But Orlando, Fla.-based graphic designer Marcelo Rizzetto is taking that pairing to a new level by creating beers inspired by each member of D.C.'s Justice League. His first six bottles honor Batman (of course), Superman, Wonder Woman, Green Lantern, Aquaman, and the Flash. In addition to incorporating each hero's logo into their beer label, he's created varietal names that correspond with each character. For example, Batman is a dark ale, Green Lantern is a pale ale, the Flash is an Irish red ale, and Wonder Woman is a classic American lager. Honestly, that last one should have gone to Aquaman, just to continue the old joke about American beer being mostly water.